The weekend has gone by in a flash! I've been so crazy busy at a college festival that when finally, a new week is here, I plan on spending this Sunday night with a slice of quiche and TV and welcoming Monday by sleeping in late. This year, the MTV movie awards took place on the 3rd on June, 2012. We all know what the word 'MTV' resonates - Brash, bold, young, vibrant and something we've grown up on. So when an entire awards show takes place with MTV in the name of the function, you know the fashion is going to be outrageous. That's why tangerine is the colour of 2012! Orange lips on Leighton ! Love the brightness and those delicious shoes ! Jen in an edgy leather dress. love the shimmer but wish it was more fitted and short. Yay for the pleated skirt & bright colours! Wish her hair was different though. Can't stand her as a person or actor but love the smokey eyes. Emma doesn't go wrong. Ever. So here's to a great week ahead guys ! Apart from college assignments being done last minute, lectures beginning before my sleep cycle ends and travelling via public transport in the monsoons; you know what else is tough? A dress code. For the lucky ones who aren't in this phase of their lives or go to a dress-code free *you lucky thing! * college; us remaining mortals have a tough task to endure. 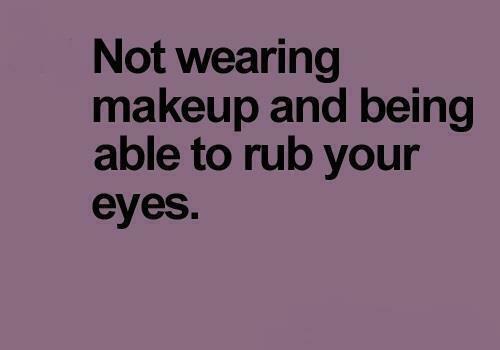 Due to that, my daily outfits has to include jeans, leggings, stockings and maxis. I've grown so used to blue denim jeans over the years so since the time I've started style blogging, I've tried out a pair of chinos and tossed on a maxi skirt on those days when my jeans just wouldn't cut it. It had been raining madly since morning and I couldn't bare the thought of sitting in class with soaking wet jeans the entire day. Plus, I needed something vibrant to lift me up during this gloomy weather. And well, what do you know! By afternoon, the grey sky was gone and the sun was peeking out of the grey clouds! Maybe, just maybe, it was the red pants. They are crazy comfy because of the loose-ish cargo style of the pants and the shade is such a bright crimson. So tomorrow *for all of us in India* is a little mid-week break because it's Independence day! A salute goes out to a beautiful country full of colours, warmth and vibrancy and the people who keep our nation safe and sound. 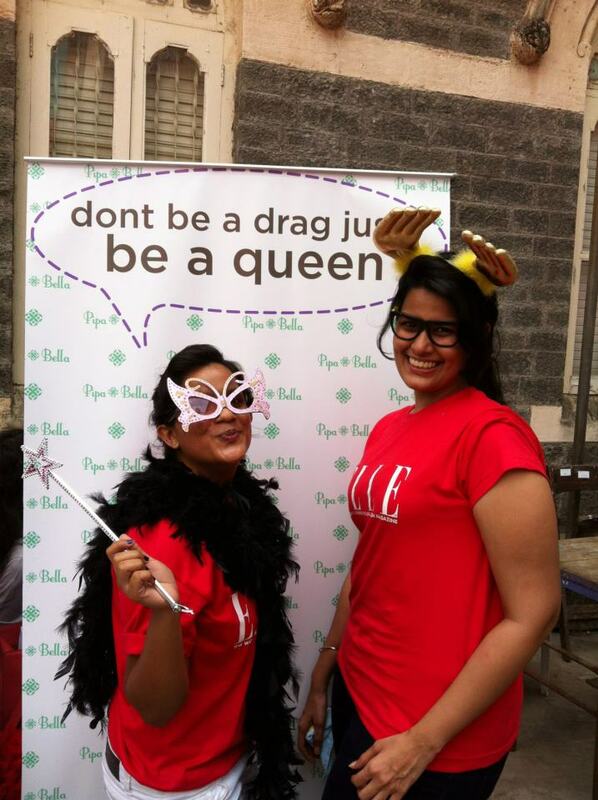 Have a great week ahead dolls! 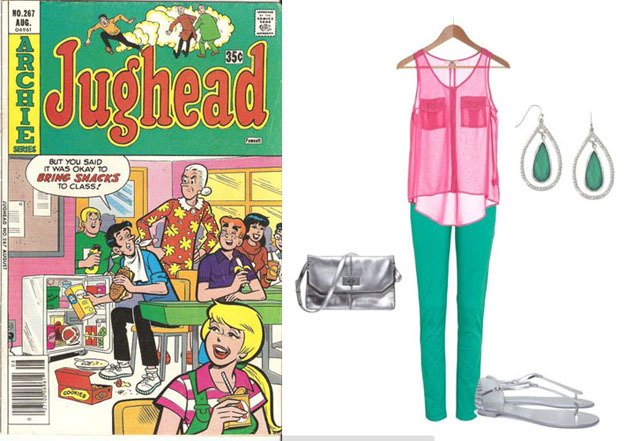 One of the things I grew up with were Archie comics. Whether it was my best friend and me sharing them, a friend nearby loaning us her old ones or just re-reading the stack at home; it wasn't a summer vacation with a dog-eared Archie comic in one hand and an orange ice-candy in the other. Ahh, the good life. Well, a few days back, I was leafing through an old Archie's, one so familiar that I remember the climax of the story before I even started. 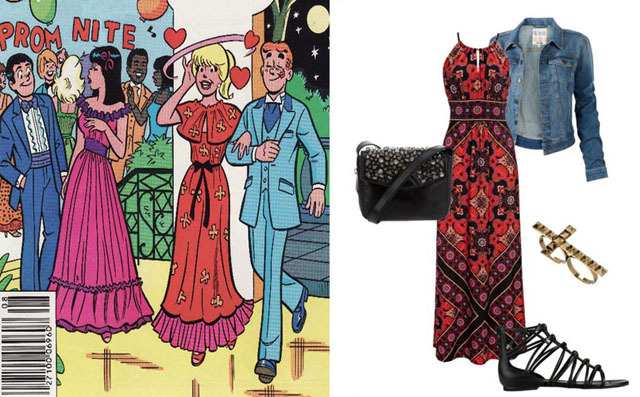 Weirdly enough, more than reading the punch lines, I found myself scrutinizing Betty's clothes and Veronica's shoes. Truth be told, they are pretty damn good dressers! So Betty's always been the goody-two-shoes while Veronica has been the pampered brat. Who ever thought that the dressings of these two characters would be so relate-able! Betty's pink and green combination looks amazing and it can look even better if the neon colours are subdued a little with throw-in of silver. Don't forget the sparkly earrings! Jughead, you hungry little critter! Coloured shorts were such a huge trend this summer - don't you just love how pretty it look wit her blonde hair! 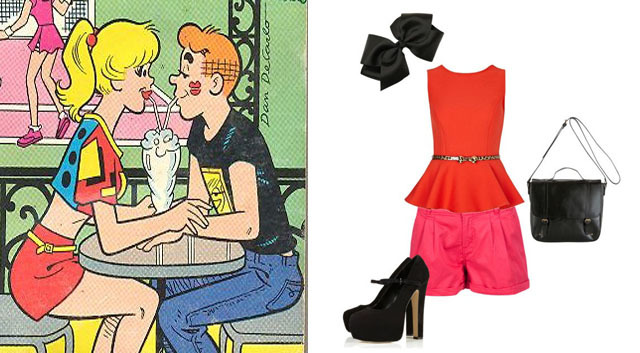 So keeping the shorts and peplum blouse as bright as possible, a pair of Mary Jane's with a girly bow would look gorgeous! Apart from the comfort that loafers bring, they look amazing, specially when paired with a pair of cropped pants like Ronnie. If the pants are vibrant, even better! And when you throw in a fringed statement bag in a rich tan with a polka dot bra-let, you're ready to go! Ronnie's showing off that toned bod in a lovely pair of shorts. Why not do likewise? Throw in a delightful pair of leopard printed flats and a quirky tee. And hey, don't forget the princess style hairband! 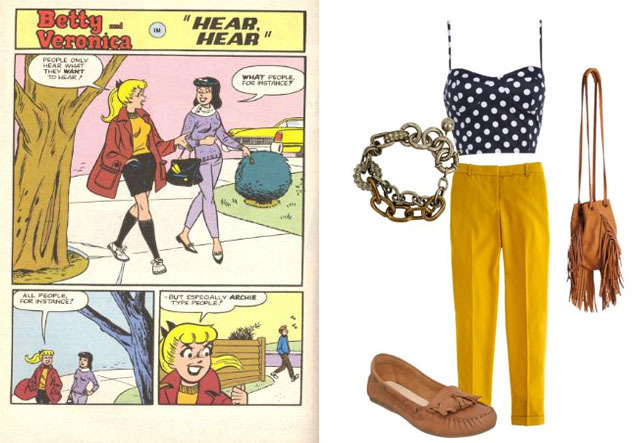 It's sweet, naive Betty is a pair of jeans probably on the phone with Archie. Well, till today, jeans are classics. And if your go for a trendy polka dot top, an armful of bracelets and a eyeball-grabbing pair of heels; they can't help but be classics! While I've associated maxi's as a more casual item, the girls have gone all out and worn it to (probably) their prom! I've styled an ethnic print maxi with a rugged jacket and an edgy sling and flats. Look at Reggie checking Betty while he's with Veronica. Typical Reggie. 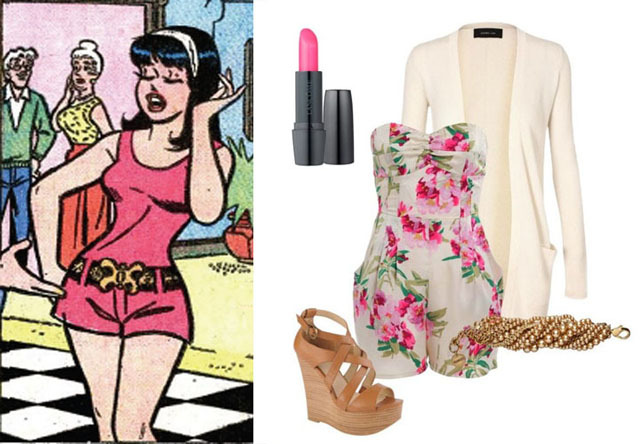 Rompers are a darling, specially if Veronica lodge is wearing them! So if you try an adorable floral one with a neutral cardigan, wedges and a chunky hand accessory; whatever the season is, I sure this is bound to look good ! So I hope you liked this weeks posts, specially this one, which childhood me would have been delighted to read! Hope the week has been treating you well dolls! And I hope we have a wet, gloomy cosy weekend ! We've all heard the good ol' saying 'Absence makes the heart grow fonder.' I've always been under the impression that it applied only to long distance boyfriend's and faraway loves. Well, not quite. Turns out that it applies to the special relationship my blog and me share too! For the unaware, I've been off the blog for a week while I've been catching up with college and life. While the week inched forward, I actually realized how much I missed my blog and you guys. I missed pouring my heart out, planning outfits, replying to comments and basically the whole shebang. What I'm trying *so hard* to build-up to is, I'm really blessed to have this blog, to have the couple of angels that help me with the nitty-gritties of it and specially, to have a tonne of sweethearts like you who read this blog. Thank you loves, and I really do mean it. So *wipes eyes* lets move on the outfit now, shall we? It was a gloomy day which was oddly hot. To combat that, I decked up with this light dress in an olive shade, something which will fit in perfectly with the upcoming fall season. It feels so good to be back here, you guys! I've got a load of outfits patiently waiting for their time to be posted, a couple of jottings of ideas for the blog and hopefully, a little happy surprise coming soon! In other news, this is my 100th post *woot woot! * and life has been going so great! I've been immersed in painting actually as a part of the project. Turns out its not all that calming, it needs precision and patience and thankfully, I'm done with them ! 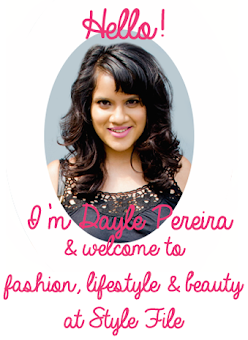 Have a great week ahead dolls & We'll talk soon!